I have yet to try making my own bao - given my inadequacy when it comes to folding dumplings, I have been avoiding folding bao! So it was good to find these delicious take-home bao in a freezer at a grocer in Richmond. This grocer has a half a freezer with other vegan products, such as mock fishballs and pork nuggets, though alas no cha siu! 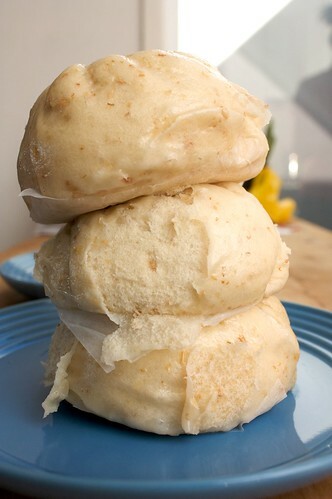 These bao are giant, I can only fit three in my bamboo steamer at once. The curry bao is not spicy, it just has a great curry flavour (kind of kapitan-ish), and the mushroom bao is a bit cha siu-ish, a little sweet but very good. I keep forgetting the name of the grocer because it's something very generic, like 'Richmond Asian Grocers' but it's at 200 Victoria St in Richmond. The bao is about $5.00 for a packet of six giant bao. Some sort of quick, Malaysian-style noodle is one of my favourite things to cook for breakfast. They're easy to cook and very filling, and lots of fun, too. They're also handy for using up leftovers, like masses of leftover rice noodles, or half a block of tofu. Featured here is some maggi mee for me, and some beehoon mee goreng for D. I threw in whatever I had around - the maggi mee features tomato, beanshoots, spinach and capsicum; the beehoon features capsicum, carrot beanshoots and lots of tofu. Breakfast of champions. 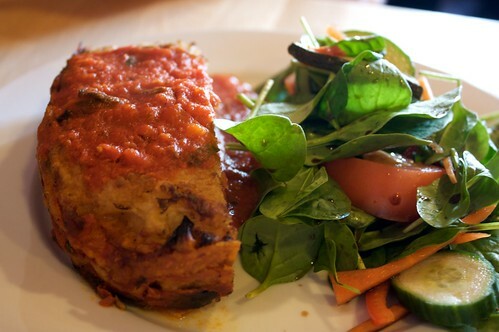 Kristy made this great post about going to dinner at Tart N Round on Friday night, and I read it on Saturday afternoon, thinking about how fantastic it would be to eat that lasagna. So this afternoon, in need of some delicious food and some cheering up, D and I ventured across town to High Street. This was a bit of an adventure, as before we'd left, we'd agreed that it was '269 or 263 or something' in Thornbury, and off we went without confirming the address! This was a big mistake, that saw us venturing as far North as Preston, before venturing South again in an attempt to find it! But find it we did, and we managed to snag a table before a huge group of cyclists came in and took every spare seat! Kristy's aforementioned post was very inspiring, as no sooner had we ordered that Cindy and Michael turned up, also for Sunday afternoon adventures! They had just lunched at La Panella (our next stop), and had decided to pause at Tart N Round for dessert. I spent approximately ten seconds glancing at the menu, mostly because I had already made my mind up, and was just confirming - I wanted the lasagna, corn sheets filled with mashed potato, roasted pumpkin, mushroom, and eggplant. It was so good! D decided upon the open burrito, which was also fantastic. 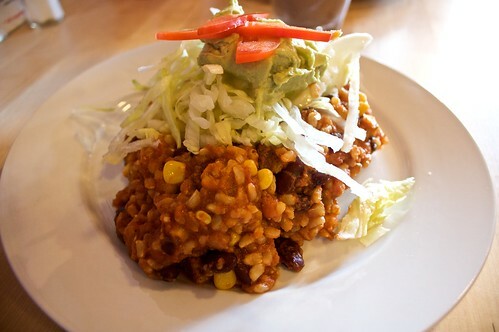 The filling included kidney beans, corn and brown rice, and it had an amazing flavour, very strong but it totally worked. I am definitely going to try this all to myself sometime. 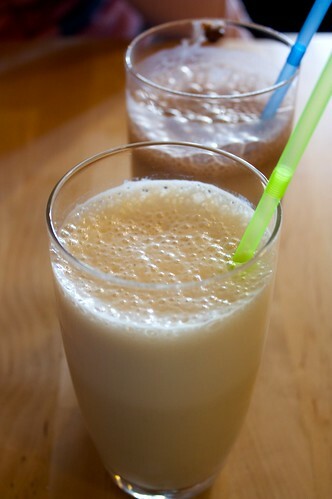 We both ordered milkshakes (with icecream) - one banana, one chocolate. The chocolate milkshake contained huge chunks of chocolate, which was a delight that left me sucking the chocolate off my hands after I fished the chocolate chunks out of the soy milk! In the end we were too full for dessert, but Cindy and Michael kindly offered us bites of theirs - I think they had a slice of black forest cake and a chocolate (and something?) cake. 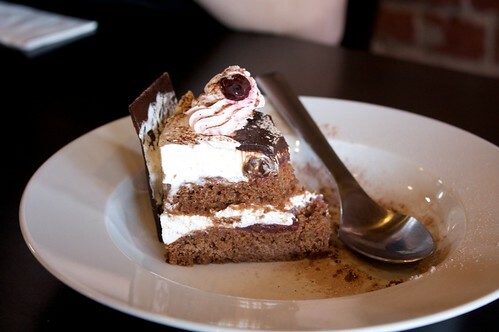 The chocolate cake was very dense and rich, and the black forest was very creamy, but they were both tasty! Everything at Tart'N'Round is gluten-free and vegetarian and free of dairy and eggs (I don't know about their honey status). Deliciousness for everyone! And we will definitely be returning for future meals - not only was the food good, but the (very busy) staff were friendly and helpful. Miss T made some delicious rice paper rolls at Sunday's potluck, and it was these we were thinking of on Thursday night when we decided to make some. I love rice paper rolls! 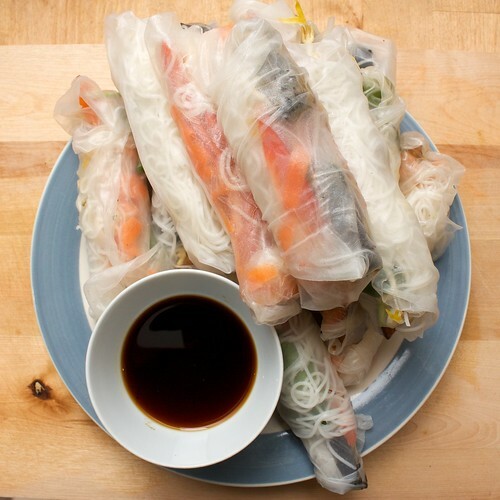 They are quick and easy to make (if you have someone giving you a hand, or if everyone rolls their own), and I always enjoy eating something that's basically raw vegetables dipped in soy sauce. For the filling, I made two types of tempeh, garlic + soy, and five-spice. The garlic + soy idea came from Tempting Tempeh, light soy, garlic, sugar, smidge of sesame oil. The five-spice was my usual, five spice + dark soy + light soy. Marinated both sets of tempeh for a few hours, whilst we traipsed out to Collingwood and Richmond for vegan adventures. 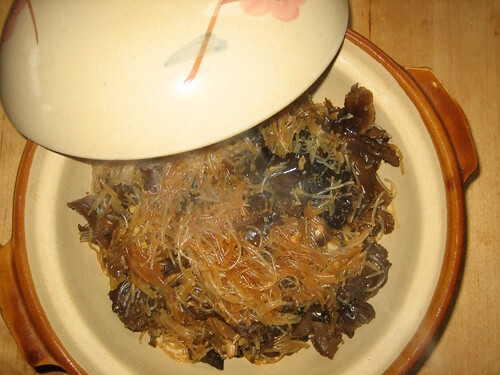 The rest of the filling comprised of beehoon (rice noodles), thin strips of raw capsicum, thin strips (using the potato peeler) of carrot, and a whole lot of bean shoots. It was a team effort, filling and rolling the rice paper, and it was delicious. Eat immediately, whilst still fresh. 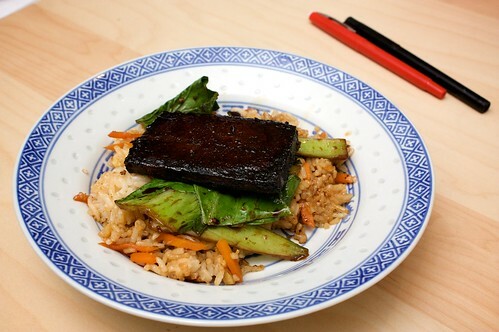 Use tamari instead of soy sauce to make this gf. and skip the five spice. 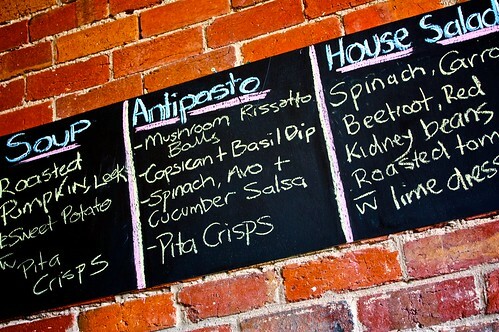 So, we don't really know what there is around Brunswick(ish) that's any good for vegans looking for takeout or delivery! Any recommendations? I am especially interested in recommendations for Thai food, but anything delicious (and definitely has vegan options) would be good. We roasted a pumpkin last week, for the purposes of a leek and roast pumpkin risotto, but this left us with about a quarter of a roasted pumpkin languishing in the fridge. We didn't want it to go to waste, so we made an effort at turning it into deliciousness. 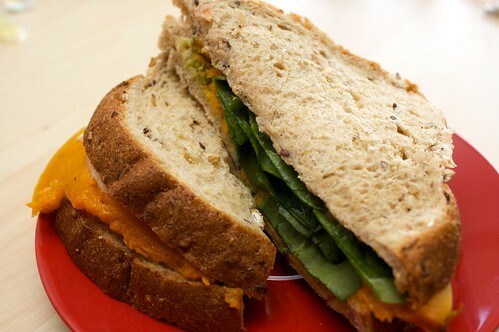 First, we picked up some fresh bread (wholemeal and multigrain, or pumpkin five seeds, something really chewy) and made some roast pumpkin sandwiches. We sliced the pumpkin like lunch meat, then heated them until they were just warm, and layered them with avocado, tomato, spinach, and hommous. Delicious! 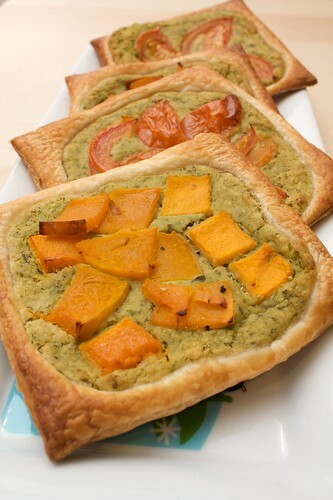 Then I modified Pip's tomato tarts with white bean pesto (which she in turn modified from Lolo). I cut the puff pastry into quarters, and chopped the tomato slices into halves in order to fan them out across the squares. I also reduced the number of cans of beans to one, though I kept the amount of pesto at one third of a cup. I made half of the tarts tomato, and the other half little squares of roasted pumpkin. I could have piled the pumpkin and the tomato on a little heavier - the amount of puffing that took place would have allowed that. Still, these were tasty, and I will definitely make them again! The theme for yesterday's potluck was 'new,' to go with Miss T's newly renovated house. There was lots of awesome food, including delicious sausage rolls, rice paper rolls, a savoury watermelon salad, an array of dips, and other delicious savoury goodies. There was a whole table of sweet goodies as well, my personal favourite was the homemade chocolate icecream, but there was also gingerbread, chocolate balls, lots of cookies, and a fantastic apple risotto thing. It was fantastic! I'm so enthused by our first proper vegan potluck experience that I totally want to hold one soon at House of Penguin! I was concerned that if I took the 'new' theme to mean new dish, or new ingredient, there might be some sort of unexpected culinary failure and then we'd have to turn up with no dish to share and I'd be all embarrassed, so we went an alternative route and took the new theme as '新年,' or Chinese New Year. I can't remember what this dish is actually called, so perhaps my sister will read this and remind me - it's something my mum cooks for CNY, and it's delicious. It's also a bit modified - it should have three types of mushrooms, but I only had two, so I went with what I had. ETA: hooray for J! It's chap chye. 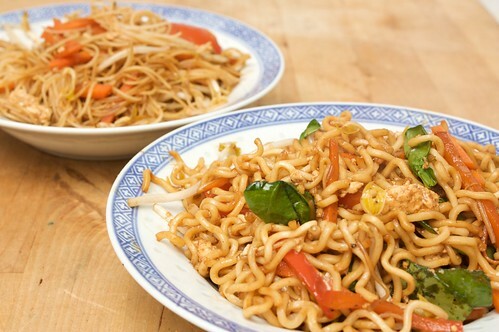 The secret to this is not to soak the noodles for too long - I always do and it messes with the consistency of the dish, but it's still delicious! Soak the mushrooms in hot water for at least an hour, preferably two. Top up with more hot water if they expand so much they're no longer covered. Soak the bean noodles until soft, then drain. In a hot wok, heat a teaspoon of peanut oil. Throw in the ginger and garlic, toss through, then drain the mushrooms and throw them in. Toss a few times, then pour in the stock and the chilli flakes. Toss through, then cover and leave to sit for about five minutes. Lift the lid and add the noodles, as well as the soy sauce. Mix through, so that the noodles are all consistently coloured. Put the lid on and leave to simmer until it has soaked up the rest of the stock and sauce - this is a dry dish, it shouldn't drip at all whilst serving. It's for longevity, you know. So, at yesterday's awesome potluck hosted by Miss T, there was a little discussion on how everyone reads blogs. Some people go to the blog address, and some people use something related to blogger, and some use google reader, and there were some other ways, too. The thing with most of these methods (aside from going to the blog address), is that they require a log in of some kind (log in to your google account, log in to your lj, whatever), and they require you to keep up, otherwise three weeks goes by and everyone's talking about the new blogger you don't know. For a while now one of the ways I've been keeping up with people is through planets. I read Planet UCC, and I've been known to read Planet Linux Australia, and planets are great because when I want to catch up with all the UCC blogs I just hit it and there it is, no worries. So D and I have sort of experimentally come up with VGML, the Vegan and Vegetarian Melbourne Planet. By using a planet, this will hopefully increase hits to Melbourne vego blogs, and be an awesome resource (new to Melbourne and looking for vegans? Try this planet...). A planet is particularly awesome for people who don't have blogs/ljs, or don't have the right kind. A planet can take in blogs from anything - so wordpress, livejournal, blogger, dreamwidth. It isn't limited by what you're logged in to. The planet should automatically update with new posts every five minutes. D subscribed a few blogs to it already, to make sure it works (I'm not sure what's up with the syndication for Pip's blog). If your blog belongs on Planet VGML, or you know a blog that does, you can email us at the link in the sidebar of the Planet. Wandering through Carlton down Lygon Street on Sunday, we passed many Italian restaurants and pizzerias. So when I turned to D and asked what we should have for dinner, we were both quick to agree on pasta! 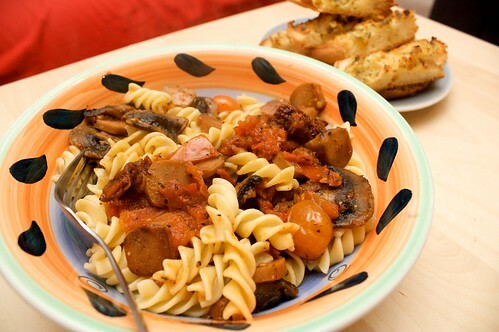 We had a couple of Sanitarium vegie sausages in the fridge, so we added them to this easy tomato pasta sauce to bulk it up a little. This is for the most part a standard tomato sauce recipe, just with extra tomatoes for awesomeness. I really liked the extra flavour that the sausages added. Heat a tablespoon or three of the oil, add a whole lot of basil, marjoram and oregano. Fry for about thirty seconds, then add the three large tomatoes, diced. Stir through the herbs, then put the lid on the pan and simmer on low for about thirty to forty minutes, stirring occasionally, until it has rendered down. Prepare the pasta, drain and set aside. After about thirty minutes, in a separate pan, heat up some more olive oil, and fry the mushrooms. When they are well cooked, add the sausages, and the cherry tomatoes, and fry for a minute or two more. Add to the tomato mixture and stir through. At this point, also add the sun-dried tomatoes. Leave it all to simmer for another five to ten minutes, then stir through the pasta and serve. On Friday night it was a bit cold and stormy, and I wanted some curry, but I wanted to try something new. I love a good Malaysian curry, or a good Thai or Indian curry, but I eat a lot of curry and I'm always looking for something new and awesome. I searched through my delicious to see what I could see, and found these two curries that worked just great. I even managed to judge the cooking time correctly so they were both ready at the same time. This spinach and tomato curry made heaps. At first I was worried that the two bunches of spinach the recipe called for would be too overwhelming, or two much, but it was just perfect. This was really delicious, and is definitely becoming a regular. Next time I might add some chunks of potato. I used Riva's recipe. This recipe had a small bite to it (but nothing you can't handle). I supplemented it with this Kashmiri Dhingri Chole from Tigers and Strawberries. 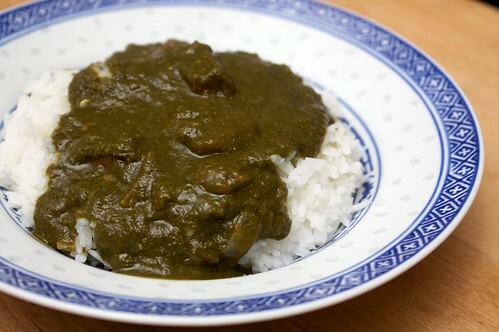 It made quite a small portion, so I was glad I had chosen to cook it in conjunction with the spinach curry, but the flavour of the mushrooms came through really well and made this a very delightful dish. This is not spicy at all. We ate these curries all through the weekend, with roti and rice. I used to be very consistent with writing up recipes immediately, even if I didn't post them straight away. This worked as a reminder for me: I would see the recipe in my document, and remember to post it; and it would mean that it would be correct for any readers who were attempting to follow my ramblings. Writing a blog has forced me to think a lot more about my cooking, I've always been a throw things in and throw things there sort of cook (I was reading another Malaysian-in-Australia blogger today who suggested this was the SEAsian way), and codifying my technique has lead me to learn a lot about myself as a cook. I forgot to write this one down, and since I can't taste it as I type, you'll just have to hope my measurements are correct (I'm pretty sure that they are). 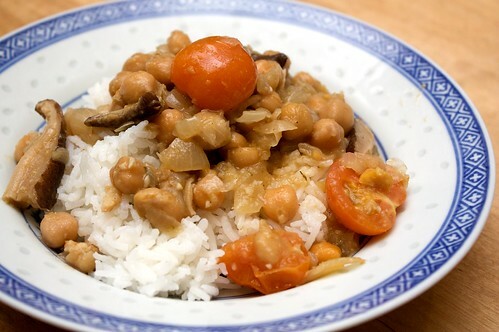 This dish is a veganised version of something my mum used to make all the time, and something that D used to love a lot. Lee Kum Kee has this great sauce, but it's not vegan, so some modification was required. So it's not that sticky tofu, not the same as my mum made, but it's close, and I like it. Combine all ingredients except the tofu. Mix until well combined. Drain the tofu, and sit on a clean tea towel or some paper towel to soak out some of the water. After some of the liquid has been patted out, slice the tofu into "steaks," of about 2x15x5cm. Coat in the marinade, and leave to marinate for half an hour to an hour. After marinating, place the on a baking tray. Thickly brush the tofu with some of the remaining marinade. As you will need to do this twice more, you may need to make more of the marinade (depending on how much the tofu soaked up). Bake at 200C for about 45 minutes, removing to turn and thickly brush every fifteen minutes. Allow to cool slightly, and serve.